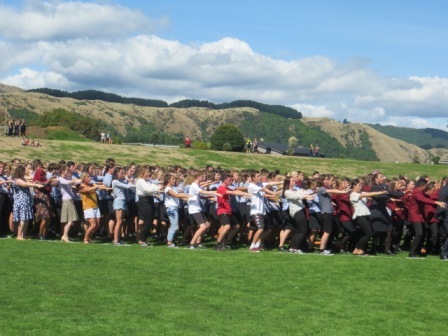 One thousand five hundred students at Kāpiti College took part in a massive haka today for victims of the Christchurch massacre. 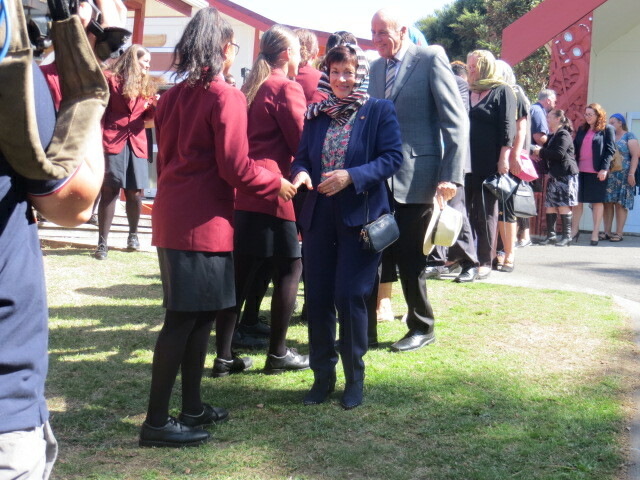 They were watched by the NZ Governor-General, Patsy Reddy, in an historic visit to Kapiti College. The students included a small group from Paraparaumu College — and elsewhere ceremonies and hakas took place at other schools throughout the district. 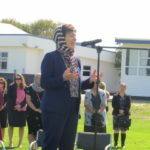 The Governor General, Mayor K Gurunathanan, fifteen hundred students and dozens of teachers and visitors listened first to the haunting sounds of the call to prayer by a Muslim leader relayed from Christchurch. Then minutes of absolute silence on the College’s playing fields, broken only by the buzz from a small light plane taking off from the local airport. 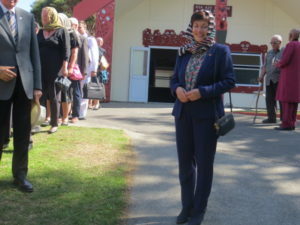 She reminded the gathering that New Zealanders comprised people from many different cultures. ‘We welcome everyone,’ she said. And she said it was ‘up to us to make sure that everyone welcomes’ the migrants. Earlier, the Governor-General and her Vice-regal group, and Mayor K Gurunathan, his wife Clare, and deputy Mayor Janet Holborow were officially welcomed to the area with a powhiri at the College Marae. Shortly after 2pm the Vice-Regal group departed, no doubt taking with them indelible memories of an amazing occasion, linking everyone at the college with the people of Christchurch and mourners from around the Globe. It was grand. Patsy Reddy was certainly there. 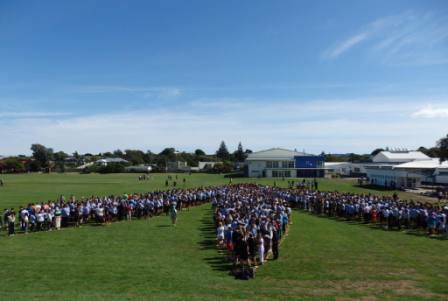 All of Kapiti College filled three spaces to form the Raukura – feathers of Te Whiti – with a smaller contingent of Paraparaumu College at the meeting point in front. The kids were great. Orderly but young-spirited. A small group of locals, including Jen and me, watched from the ridge overlooking the field. A recording of the call to prayer was played over a sound system – what remarkable music it was, so emotional – then everyone stood in silence for the two minutes. A singer led the students in singing Te Aroha, then came the haka. Perfectly executed. We were watching from behind as a forest of arms rose and fell like trees in a gale. Mayor Guru spoke on behalf of the community, then Dame Patsy spoke and we finished with a karakia from Kaumatua Don Te Maipi and the crowd dispersed. Students assembled in an arrowhead formation similar to the feathers of Te whiti the prophet. Photo taken from the east of the field by Anthony Dreaver.